There’s been a lot of fuss overnight about what exactly Apple is claiming ownership of in the Terms and Conditions associated with its new iBooks Author application for Mac. The fuss is understandable, because the wording of the license agreement gets a little bit muddy. Q: Can I distribute works created with iBooks Author as part of a product or service that charges a subscription-based fee? 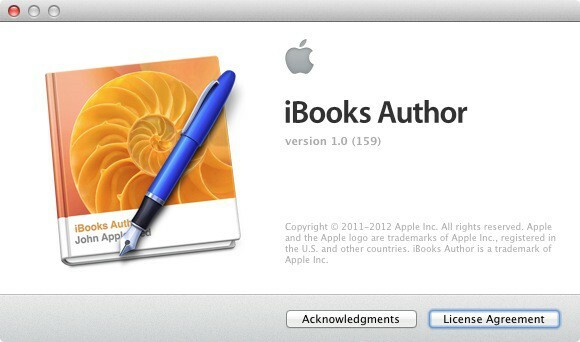 A: Books created with iBooks Author may not be sold as part of a subscription-based product or service. iBooks Author books must be distributed free of charge or made available for sale via the iBookstore. Note the careful wording of “works created with iBooks Author”, “Books created with iBooks Author”, and “iBooks Author books”. They all refer, very specifically, to the finished product you create with iBooks Author. Q: I’m an author (or publisher). Can I distribute this work on my own website? A: You may distribute books created in iBooks Author free of charge on your own website. If you wish to sell your book, you must do so through the iBookstore. What isn’t clear here is the difference between what Apple calls a book, and what (for want of a better word), I’ll call the text. The book is the finished product. The text are the words you wrote that go inside it. In this FAQ, Apple doesn’t do a very good job of clarifying this crucial difference. But it is clarified in the application’s license agreement (which you can get to from its About box). So, the thing Apple calls a book or a Work is the completed, formatted file that is generated by iBooks Author. That’s the thing you can only sell through the iBookStore. But: the text remains yours. The unformatted raw text that you slaved over in Word or Scrivener or BBEdit or whatever you use to write in – that text is yours to reformat in another application, resulting in a file of a different format, which you’re free to sell elsewhere if you wish. Dan Wineman is right when he says that Apple is claiming a right to this software’s output. But don’t misread that to mean that Apple is claiming all rights to the written text that makes up a part (albeit the larger part) of that finished work. At least, that’s my understanding of it all. I might be wrong. Please don’t tell me I’m wrong; my brain hurts enough already.